Professor Linus Wilson discusses his new paper "Clickbait Works! The secret to getting views with the YouTube algorithm." There is a lot of contradictory advice about what metrics the largest video sharing site in the world and the second largest social network promotes. Using a new data set available to YouTube creators starting in 2018, Dr. Wilson finds that click-through rates are by far the most important predictor of a new video getting views from YouTube's black-box recommendation system. Click the download button for a free download. Next, if you don’t want to register or login with SSRN, click “Download without registration” under the gray text under the picture of Greg Gordon. In 2018, YouTube began releasing click-through rates (CTR) data to its video creators. Since 2012, YouTube has emphasized how it favors watch time over clicks in its recommendations to viewers. This is the first academic study employing that data to test what matters more for views on YouTube. Is watch time or CTR more important to getting views on YouTube? This paper finds no to limited evidence that higher percent audience retention or and total average watch time per view are associated with more views on YouTube. Instead, videos with higher CTR got significantly more views as did videos on trending or newsworthy topics. The marginal benefit in terms of views scaled by subscribers of increased CTR is between 71 and 318 times larger than the marginal benefits of increased watch time per view. Find out about the secret $2.7 trillion bailout of Money Market Mutual Funds MMMFs in 2008. The collapse of Lehman Brothers its commercial paper default caused the Primary Reserve Fund to "break the buck" or sell for less than $1.00 per share. The U.S. Treasury rolled out a bailout guarantee on September 19, 2008 without Congressional approval using the exchange rate stabilization fund led by Hank Paulson, David Nason, and Steve Shafran. Paulson and Shafran were Goldman Sach alums (p. 263) ON THE BRINK by Henry Paulson. This is the first study to look at the characteristics of funds accepting the $2.7 trillion taxpayer guarantee of money market mutual funds during the 2008 financial crisis. Funds with lower asset maturities were significantly less likely to need federal or sponsor bailouts. Fund shares that benefited from Federal Reserve’s asset-backed commercial paper program were significantly more likely to get bailed out by taxpayers and sponsors. Finally, the paper tests if funds adhering to the SEC’s 2010 liquidity reforms prior to their enactment were less likely to be bailed out in 2008. Janna Wilson performs Minuet by Boccherini. Linus Wilson reads his recently updated working paper entitled "A Dove to Hawk Ranking of the Martin to Yellen Federal Reserves" and talks about the current state of Federal Reserve interest rate policy. He previews his talk with the New York Times Bestselling author Roger Lowenstein which will be released in an upcoming episode. "A Dove to Hawk Ranking of the Martin to Yellen Federal Reserves"
This note ranks the Federal Reserves based on the tenure of their chairs from William McChesney Martin, Jr. to Janet L. Yellen, using data from 1958 through 2018. Inflation “doves” are willing to tolerate more inflation than inflation “hawks.” Comparing the Taylor (1993) rule and core inflation to the effective fed funds rates, it is found that the Yellen Fed is the most dovish Fed since 1958. This paper reflects the views of the author alone. The author thanks Zhenbin Liu for providing excellent research assistance. This paper develops a formula to numerically estimate the unsubsidized, fair-market value of the toxic assets purchased with Federal Reserve loans. It finds that subsidy rates on these loans were on average 33.9 percent at origination. In contrast, by the 3rd quarter of the 2010, there was on average no subsidy in TALF loans. The theoretical model is used to predict the early redemption of Term Asset-Backed Securities Loan Facility (TALF) loans used to purchase commercial mortgage backed securities (CMBS). The predictions of the model are strongly supported by the data. In addition, this paper looks at the determinants of early redemption. CMBS originated inside the peak bubble years of 2005-2007 were much less likely to be redeemed early. The giant investment managers, Blackrock and PIMCO, were much more likely to redeem their TALF loans early than smaller investment managers. Come and see Dr. Wilson present the paper at the 2018 Midwest Economics Association meeting on March 24, 2018, at 1:15PM in session 7E Credit. The MEA conference in at the Hilton Orrington in Evanston, Illinois. Like the Finance Professor Podcast's Facebook page to see any Facebook live versions of MEA conference presentations. Professor Andrew Metrick is the Michael H. Jordan Professor of Finance and Management at the Yale School of Management. He is the director, Yale Program on Financial Stability and the Faculty Director, Masters in Systemic Risk program at Yale. 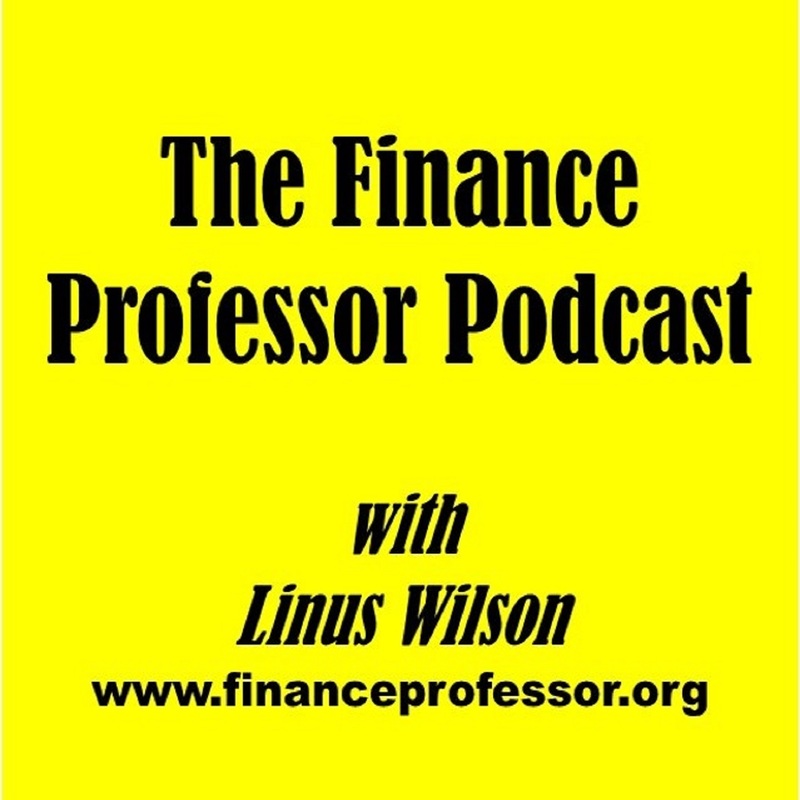 Linus Wilson reads his joint work with Wendy Yan Wu of Wilfrid Laurier University and updates the plans for the 2018 for the The Finance Professor Podcast. Does Receiving TARP Funds Make it Easier to Roll Your Commercial Paper Onto the Fed? The Commercial Paper Funding Facility (CPFF) bought commercial paper from highly-rated issuers of U.S. dollar commercial paper during the financial crisis of 2008 to 2009. This is the only study to analyze the characteristics of firms selected for this Federal Reserve program. CPFF participants and non-participants differed little in terms of profitability, solvency, or liquidity ratios. Nevertheless, CPFF participants were significantly more likely to come from the financial sector, to pose greater systemic risks, and to have received funds from the Troubled Asset Relief Program (TARP) bailout. The baseline predicted probability of participation in the CPFF jumps from 37.2 percent to 65.9 percent if the commercial paper issuer participated in the TARP bailout. Professor Andrew Metrick is the Michael H. Jordan Professor of Finance and Management at the Yale School of Management. He is the director, Yale Program on Financial Stability and the Faculty Director, Masters in Systemic Risk program at Yale. Professor Metrick was an assistant professor in economics at Harvard University and was an assistant and associate professor of finance at the Wharton School of Business at the University of Pennsylvania. He also served as a senior economist and the cheif economist on President Obama's Council of Economic Advisers while the administration worked on the Dodd–Frank Wall Street Reform and Consumer Protection Act and tried to manage the hugely unpopular bailout of the financial sector, the Troubled Asset Relief Program (TARP). The latter bailout turned a modest profit and many believe it helped to stabilize the financial system. Professor Metrick outlines the responses to the 2008 financial crises in the USA and abroad and speaks about the tension between regulation and shadow banking. This was session 214 at the Marriot Copley Place. The next meeting is in San Diego. Look to my CV for the full citation of published papers. Dr. Jeffry L Coles a Professor of Finance at the David Eccles School of Business at the University of Utah and served as the Vice President of the 2017 Annual Meeting Program . Professor Linus Wilson reads his paper "Discrete Portfolio Adjustment with Fixed Transaction Costs"
"Overpaid CEOs Got FDIC Debt Guarantees"
You can download it by hitting the orange download button at the link. "By scaling pay by AACSB averages pay across business school disciplines can be analyzed. This study looks at a unique data set of business school professors at the University of Louisiana at Lafayette. It finds large disparities in pay between the business disciplines that cannot be explained by the market price of scholars in the disciplines, research productivity, or faculty to major ratios. The finance professors were the lowest paid of six disciplines as a percent of AACSB pay, but had the highest research productivity and majors per research faculty member at the Moody College of Business Administration (MCOBA). Finance professors were paid about 20 percent less as a percent of the AACSB average for their rank and discipline than other research faculty at the MCOBA. Members of the management department were paid significantly higher percent of AACSB average pay than other professors in the business school. This data may be indicative of a misallocation of resources. The approach in this paper could be applied to analyze pay practices at many other business schools and over many other time periods." Sign up for the free newsletter at www.financeprofessor.org. Check out the podcast blog at https://financeprofessorpodcast.wordpress.com/. Subscibe and write a rating or review on iTunes. Like us on facebook, follow on twitter, or subscibe on YouTube. "This study finds that YouTube channels crowdfunding on Patreon have more frequent video creation. The median YouTube channel that crowdfunded on Patreon produced a video every 7.5 days compared to 105 days for the median comparable channel that did not link to Patreon. Crowdfunders have more views per video, are more likely to link to their Facebook pages, and uploaded videos more frequently. While two channels in the sample, each earned over $150,000 in 2016 from Patreon, the typical crowdfunding sailing channel earned $73 per video, per month, or creation. It appears that a little bit of money was associated with a big increase in new video production."